The Internet told me that Valentines Day was coming up. The Internet also tells me where I can meet rich single men. Great. Cheers Facebook. As if I wasn’t getting enough of that from my Indian fruit and vege man and my grandmother who reassure me that there are plenty of fish in the sea and that I will find a good husband one day. I still don’t know why there isn’t a facepalm emoticon yet. I spent last Valentines Day with my cousin Hannah. We had a great date day. We got sushi and hung down by Britomart where we listened to traditional Indian love songs and got given free flowers. I'm almost 22 and that has to be the best and actually most romantic V-day to date so far (remember dating your cousin was way cool back in Miss Elizabeth Bennet's day :P). While as much as I dislike the cheesy, frilly and candy-coated fuss of it all I do really like the idea of giving handmade treats to your friends and loved ones just to say “hey, I think you’re pretty great”. I do love making people gifts and sending them as part of ridiculous care packages. The current recipient will be able to vouch for that. As soon as he receives the previous one in the mail I start conjuring up the next one in my head. These homemade shrewsberry biscuits are a practice run for next week’s ordeal. When I was younger I was always a bit OCD about my shrewsberry biscuits, you know the Griffins ones. I had to always have equal numbers of heart punched ones as I did the triangles and circles. So biscuit consumption always had to happen in multiples of three. Here I am wondering why I was a chubby 12 year old . . .
book by Kim Evans. The recipe calls for making your own raspberry filling but alas my freezer was not chocker block full of frozen raspberries. I used some good quality Anathoth jam instead. When making biscuits such as these, it is important that the dough is kept chilled and the raw circles are cool when they enter the oven. Ok quick food science lesson. So when a biscuit containing butter is put in the oven, the butter melts causing the biscuit to spread outwards. When a biscuit contains egg (more important in this case, egg white) at a certain temperature the albumin proteins denature forming a gel. This stops the spreading of the biscuit. So in order to get a clear cut shape you need to balance these two reactions (Ifreakinglovescience). So by chilling the dough first you give the egg white a head start, so basically the outer surface will solidify before the butter has a chance to melt outwards. You can use whatever shaped cookie cutter you like. I went all mainstream and traditional and used my Mum’s scone cutter to create the frilly circle. I hunted all around the kitchen to find something suitable for the centre punch until I remembered that the base of a piping tip would work just smashingly. Oh and it did. Sometimes the dough got stuck in it so all you have to do is blow on the other end to get it out. Let’s do this shall we? Beat the butter to loosen it up. Add in the sugar and cream together until a very pale yellow is achieved and its just generally a fluffy delight. Beat in the eggs one at a time, beating until the mixture has reached fluffiness beyond your wildest dreams. Add in the vanilla and mix that in too. In a separate bowl, sieve together the flour and baking powder. Pour that into the egg mix and gently fold together using a large metal spoon. Turn the dough out onto a floured bench and bring it together with your hands until a nice dough ball forms. Wrap in cling film and refrigerate for an hour. Once the dough has chilled, preheat the oven to 180 Celsius on bake and line a baking tray with baking paper. On a floured bench, roll the dough out until it is 3-4mm in thickness (yes get your calipers out if you need to – slash not, I just guesstimated). Start cutting out your shapes and placing them on your tray. Make sure you punch a hole through the middle of every second biscuit. The dough circles that don’t fit on the first tray, store them flat in the freezer until it is time to bake them. Bake for 10-13 minutes or until they are just ever so slightly golden. Remove from the oven and wait until they have firmed up slightly before moving them to a wire rack to cool. 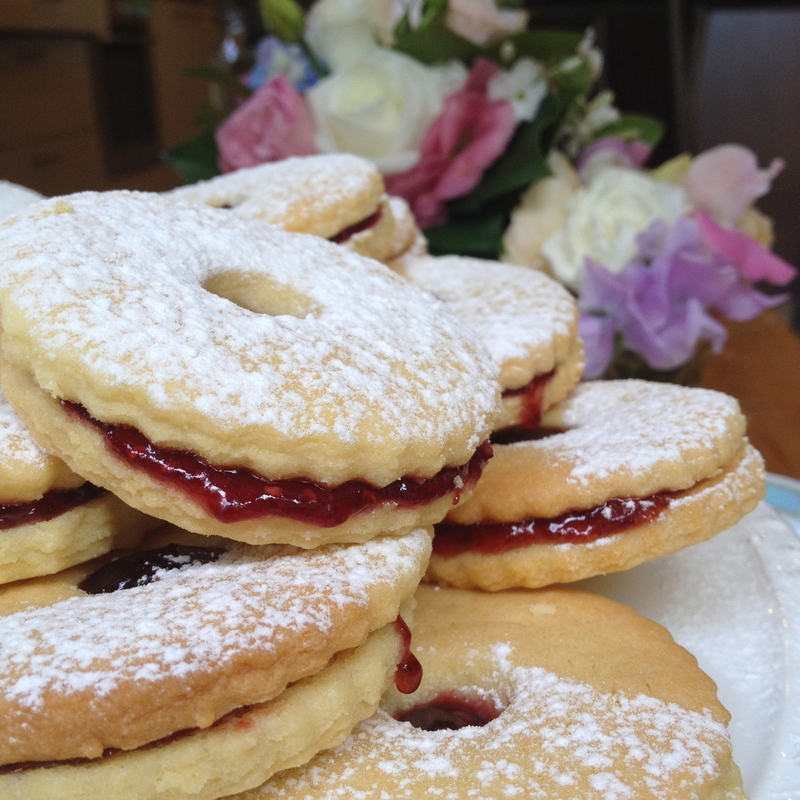 Leave to cool fully before sandwiching them together with a good dollop of jam! Share these with people you think are “pretty great”. OH MAAAAY GAAAWDDDD YOU MADE SHREWSBERRIES>>!>!>!>!>!>!>!” - true story. I actually copied and pasted the text straight into here. Guess he’s in for a treat then. In "Biscuits", "Cookies", "Edible gifts", "Jammy Dodgers", "Shrewsberries", "Shrewsberry biscuits", "Valentines Day"